If you desperately need a new affordable smartphone or a second phone, DiGi is now offering the Lenovo A606 and Asus Fonepad 7 for free when you sign up for a contract with the telco. The deal will tie you up to a 24 months contract with DiGi but thankfully, you can opt for one of the more affordable postpaid plans offered – SmartPlan 78 or SmartPlan 108. Retailing at RM469, the Lenovo A606 is a mid-range LTE-enabled Android smartphone. It features a large 5” display with a resolution of 480 x 854, and is powered by 1.3GHz Cortex-A7 quad-core processor. Other specs include 1GB of RAM, 8GB of storage (expandable up to 32GB), 8MP rear camera, 2MP front camera, and has a 2,000mAh user-replaceable battery on board. As for the Asus Fonepad 7, it features a large 7” display with a resolution of 600 x 1024. It is powered by a 1.2GHz dual-core processor with 1GB of RAM and 8GB of internal storage (expandable up to 64GB). Other specs include 3G connectivity, 2MP rear camera, VGA front shooter, and runs on Android 4.3 out of the box. 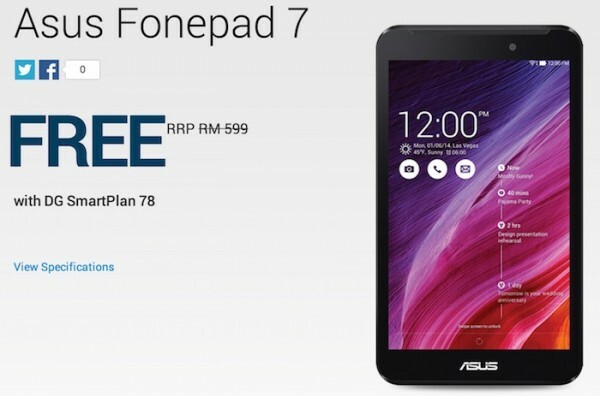 Visit DiGi now to find out more about its Lenovo A606 or Asus Fonepad 7 bundle.